A radar system in which the object to be detected is fitted with cooperative equipment in the form of a radar receiver/transmitter or a trans-ponder. Radio pulses from the interrogator (transmitter/receiver) site are received in the cooperative equipment and used to trigger a distinctive transmission from the transponder. 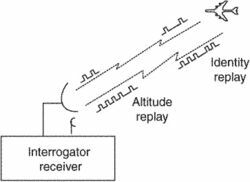 This latter transmission, rather than a reflected signal, is then received back at the transmitter/receiver or interrogator site. The interrogation is done at 1030 MHz, whereas the response is at 1090 MHz. The system provides an automatic altitude reporting facility. Current FAA plans call for replacing up to 150 air traffic control radar beacon systems (ATCRBS) with new monopulse secondary surveillance radars.